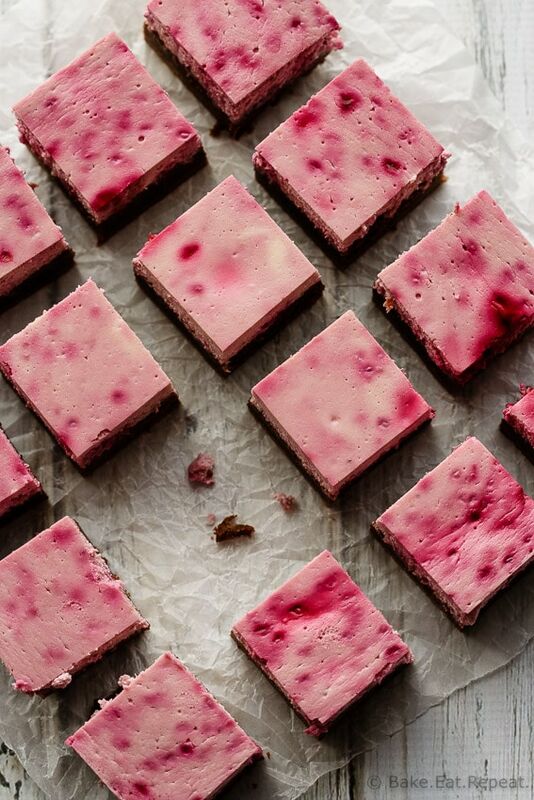 Raspberry Cheesecake Brownies - Bake.Eat.Repeat. So January is almost over. That means I can share more treats here right? It totally does – so I made some raspberry cheesecake brownies. Although, if I’m honest I’m still in healthy eating mode right now and had a hard time deciding on something decadent to make. That isn’t usually a problem for me. But time is flying by and I can’t even believe it’s already the end of the month. January always goes fast for me though. My older sons birthday is right in the middle of the month, and that always kind of throws me. The holidays end and suddenly I need to plan a birthday party (which we usually end up doing at least a week after his birthday since it IS so quick after Christmas!) and then suddenly January is over. I don’t know why having a birthday in the month makes it go fast but it sure seems to. Or I’m just getting so old that I’m becoming one of those people that is constantly ranting about how fast time is passing. We’ll just go with the first option. At any rate, I actually got my act together and came up with a Valentine’s Day treat for you before the actual day. You know, for those people that actually plan things like that. Clearly I am not one of them. I’ve been blogging for a while now, and I’m still just posting what I’m making. No planning ahead for holidays and things. I’m more of the, “it’s such and such a holiday tomorrow, maybe I should have made something earlier so I could post it” type of planner. In that I don’t. Plan. Ever. I’m working on that. Getting recipes up here for the correct time of year before it passes. I’ve actually accomplished it this time! Don’t hold your breath on me keeping that up, but I’ll try! 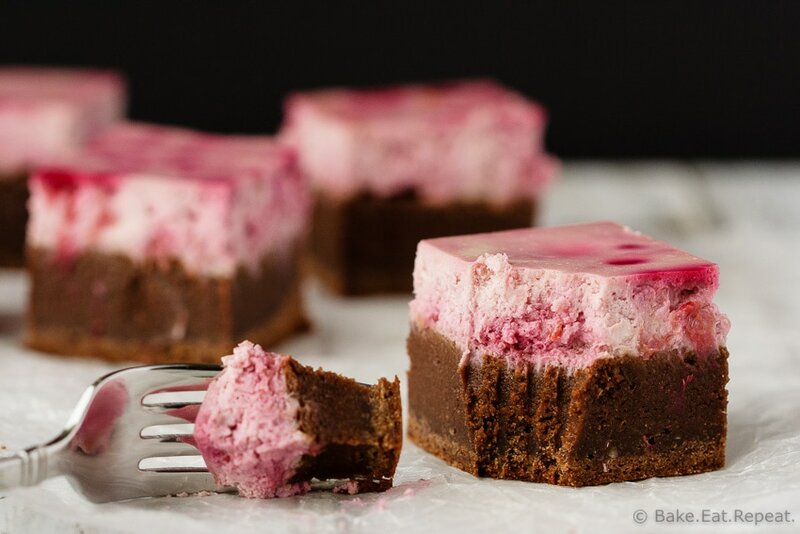 And these raspberry cheesecake brownies? They are perfect for a Valentine’s Day treat. A fudgy, chocolatey brownie base topped with a creamy raspberry cheesecake layer. They’re fantastic. You should definitely make them, even if you don’t need anything for the day itself. Just make them anyways. January’s almost over – a little chocolate is in order! Looking for more Valentine’s Day treats? Here’s some of my favourites! 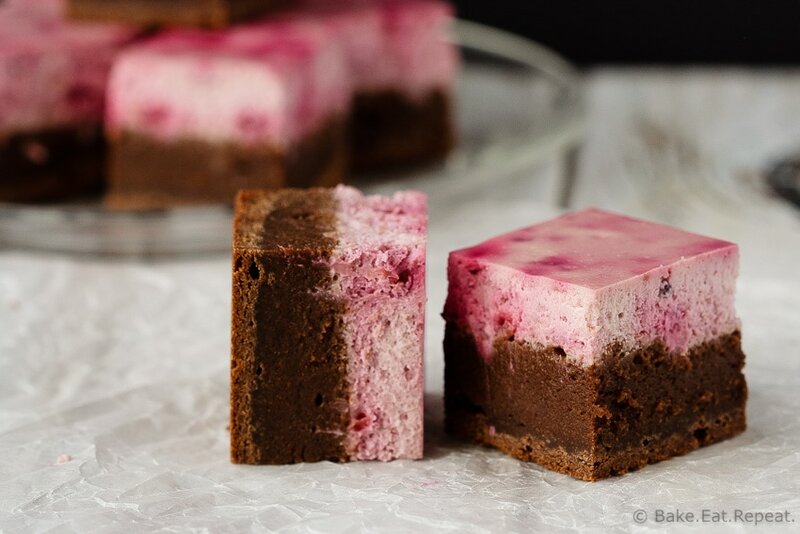 Easy to make raspberry cheesecake brownies that are perfect for Valentine's Day! Or for a special dessert. Or just because. These are amazing! Preheat the oven to 350 degrees F. Line an 8x8 inch baking pan (I use glass) with parchment paper and set aside. In the bowl of a stand mixer, or with an electric mixer, cream together the butter, sugar and brown sugar until light and fluffy. Add the eggs and vanilla and whip again until well combined. Add the flour, cocoa powder and salt and mix until well combined. Spread the brownie batter in the prepared pan, smoothing it out into an even layer. Make the cheesecake layer. With an electric mixer, whip the cream cheese, Greek yogurt and eggs until smooth. Add the sugar, flour and vanilla and mix again until smooth and well combined. Fold in the crushed raspberries. Spread the cheesecake mixture on top of the brownie batter. Bake for 50-60 minutes until set, and the edges are starting to brown. Place the pan on a wire rack to cool for about an hour and then chill for 2-3 hours before lifting the bars out and slicing into squares. Source: Brownie layer from my Pumpkin Cheesecake Swirled Brownies , cheesecake layer adapted from Sally's Baking Addiction . Hello can I substitute raspberry preserves for whole raspberries ? I only have natural baking cocoa-any recommendations? I think natural baking cocoa would be fine in the brownie. I'm not sure about the raspberry preserves, I think that I wouldn't use as much - maybe try with 1/4-1/2 cup of preserves in place of the 1 cup of raspberries? I've never tried that though so I can't say for sure, but that's what I would try. Raspberries, cheesecake and chocolate? This has everything I love combined in a single dessert! I won't need to wait for Valentine's Day to make this! Yes, I've frozen them before. Yes - overnight is fine! Hmmm, just wondering. Can I substitute full fall sour cream for the Greek yogurt? No one will eat the yogurt that is left over, but the sour cream is usually consumed. Hi Diane - I've never actually tried sour cream in a cheesecake recipe, although it is a reasonable substitute for Greek yogurt in most things so it might be fine. I think if you don't want to use Greek yogurt though, the best substitute would be more cream cheese. Most cheesecake recipes use all cream cheese or a mix of cream cheese and Greek yogurt so using just cream cheese will work just fine. I want to double the recipe fora party but I'm not sure how long to bake them for. .. help? I haven't doubled this one yet, but you could either make a double recipe and divide it between two 8x8 inch pans to bake, or you could bake it all in a 9x13 inch pan. I don't think the baking time should change much, most recipes that bake in an 8x8 inch pan double nicely into a 9x13 inch pan, and I don't usually find you need to change the baking time. As long as the cheesecake is set and the edges are just starting to brown it should be good! I made these for Sunday dinner at my grandmas today. They were SO good. The tangy fresh raspberries mixed in the creamy cheesecake worked so well with the chocolate. I didn't make any changes to the recipe, kept it in the fridge phone ready to serve. Everyone loved them. Thanks for the recipe! Just wondering, is 1/4 cup of cocoa powder correct in this recipe? I made these today and was SO looking forward to them for dessert after our Sunday dinner. I thought when I mixed the brownie layer up it looked rather pale for brownies, but I had followed the recipe exactly so I went with it. The brownie wasn't nearly chocolately enough, in fact it was bland. Thanks for the idea, though...I love the raspberry and chocolate together. I'll try again with more cocoa next time! Hi Ronna - 1/4 cup of cocoa powder is correct for this recipe. It's a brownie recipe I've used many times and I've never found it bland or not chocolatey enough. I'm sorry they didn't work out for you! I always use Dutch processed cocoa powder - if you're using natural cocoa powder that would make a difference as the natural cocoa powder is lighter in colour and isn't as intense in it's flavour as the Dutch processed kind. Haha, I have whole lists of things I want to make and haven't gotten around to - not enough time!! :) Thanks Manali! Hahaha, unlikely but thanks! :) I love raspberries and chocolate together! Oh my goodness! These brownies look phenomenal! I've never baked with raspberries, but these are so perfect for Valentine's I'll have to change that ASAP! These definitely caught my eye on FB. They're so gorgeous! I love how you used the fruit to create that amazing color! And the fudginess of the bottom...YES. 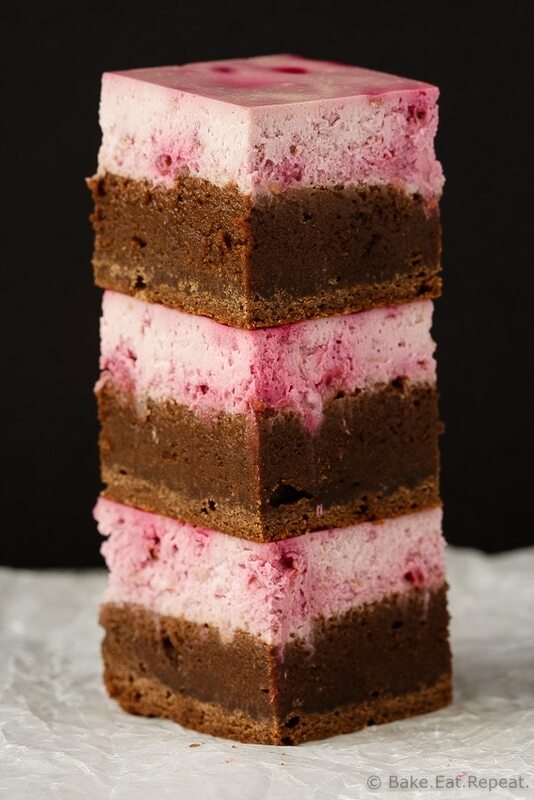 These brownies are GORGEOUS - I'm swooning over that lovely raspberry cheesecake layer! These look so, so stunning!! As a fellow poor planner, I feel your pain! I keep meaning to do a Valentine's day dessert, but I make other things instead! I've still got two week. Maybe I'll change my ways. These are stunning and insane and beautiful and I can't wait to make them. Cheesecake + brownies = pure bliss! And raspberries just make everything and anything taste amazing! These look like the perfect Valentine's Day treat. I can say with certainty that my valentine would LOVE these!! These brownies are absolutely stunning, Stacey! I love the raspberry and cheesecake combo, especially with the chocolate. So perfect for valentine's day!